The U.S. Department of Housing and Urban Development (HUD) recently released its year-end 203(k) endorsement summary report and HomeBridge Financial Services ranks No. 1 in 203(k) loans for 2017! With its year ending September 30, HUD reported that HomeBridge had 1,083 endorsements for 2017, which was 217 more than any other lender. Once a 203(k) loan is funded, it is sent to HUD for an FHA insurance endorsement. HUD reviews the file for completion and provides the Mortgage Insurance Certificate, which deems the file endorsed. “It’s a great honor to be the No. 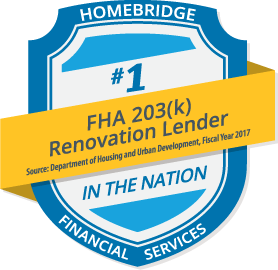 1 FHA 203(k) lender in the nation,” said Steven Marshall, HomeBridge’s National Renovation Manager, “but our primary objective is to be known as the ‘Best Renovation Lender’ in the country. Being No. 1 is a huge bi-product of achieving that objective. Other keys to HomeBridge’s success have been hiring top-tier renovation talent and creating a dedicated Renovation Concierge team, which gives more attention and a specialized experience to every renovation loan entering the pipeline. Contact your local HomeBridge Originator if you would like to learn more about HomeBridge’s renovation financing programs!